I don't think there is a MAC foundation that I have not tried yet. I love MAC, and I love foundations, so, in my eyes at least, MAC foundations are no brainers. I was absolutely blown away by the release just before this one- the Pro Longwear Nourishing Waterproof Foundation which I blogged about here- and I had high hopes for this Studio Waterweight Foundation also. Word on the street (i.e. social media) was that this foundation is meant to give you that runway supermodel effortlessy perfect skin- MAC themselves promise "an innovative foundation that delivers colour in an ultra-fluid, elegantly thin, elastic gel serum formula". I love my full coverage foundations, don't get me wrong, but the older I get, the more inclined I am towards those dewier, more radiant options. The dew to me has become what bass apparently is to Meghan Trainor- I'm all about it. So I hopped and skipped to Brown Thomas to part with €36.50 to try this out for myself and, in doing so, broke my rule of buying a foundation without a sample... that is how much faith I have in MAC foundations. I was to be disappointed. Packaging wise, this foundation is different to any other MAC foundation packaging, as it's not your typical glass bottle with pump dispenser like the Studio Fix, Pro Longwear, Mineralize, etc. and it's not a squeezy tube like the Pro Longwear Nourishing Waterproof or Studio Sculpt foundations. The new MAC Studio Waterweight Foundation has a little pipette or dropper applicator, which instantly gives you an idea of the texture of the product inside. Unlike the MAC Pro Longwear Nourishing Foundation, you get the standard 30ml of product in this new foundation. 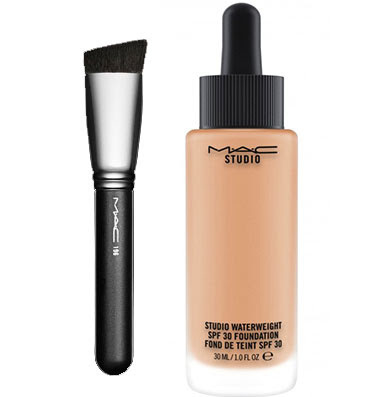 MAC profess that this foundation has the consistency of a serum and not a regular cream/liquid/gel foundation and it contains the highly hydrating "Moisture Fusion Complex". In terms of application, you can use your fingers, brush or blending sponge to apply this foundation. MAC actually promote the use of the brush no. 196- the Slanted Flat Top Foundation Brush- with this foundation but after a quick feel of it instore, I was not convinced. I used both my Nima Brush Domed Head Kabuki and my Beauty Blender to apply this and I much preferred the finish with the brush. Beauty Blenders and sponges tend to make your foundation go on more dewier anyway and I just thought it was a little too much with this particular foundation. For that reason, I definitely recommend a very densely packed foundation brush. The pictures below show the foundation freshly applied and buffed onto my skin. I've no base at all on in the picture on the left so you can see the amount of coverage you get by comparing that to the middle picture. I would say the coverage is very sheer, buildable only to medium. The consistency of the foundation feels similar to MAC Face and Body but I would say that Face and Body provides a little more coverage. When this is buffed in, it leaves a very thin film of foundation on your face. I found it took about two full drops of this foundation to cover my face. As you can see from the pictures above, this applies incredibly dewy- and I'm not convinced if it looks dewy or just plain oily and greasy. 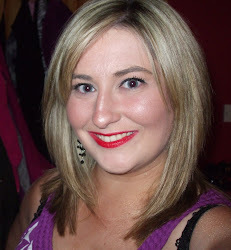 I do not have even remotely oily skin, my foundation only starts to shine when the weather outside gets extremely hot. This foundation made me feel like I had oily skin. After four hours of wear, I noticed that my pores around my cheeks and nose had become more visible and that the foundation was beginning to break away from my chin area. After eight hours of wear (which is no way longwearing enough for me on a daily basis), the foundation on my chin just evaporated (despite me not having oily skin), it began to cluster around my nose and I felt I didn't look dewy but shiny- and there is a distinction there. I hate how this foundation wears on my skin in all honesty. I had high hopes for finding something moisturising that would not look oily on my skin but this is not the answer I was looking for. If you have really dry skin, you might love this, but if you have combination or oily skin, I would avoid this like the plague. This might also be a very flattering foundation for dry, mature skins if you are looking to inject a bit of glow. 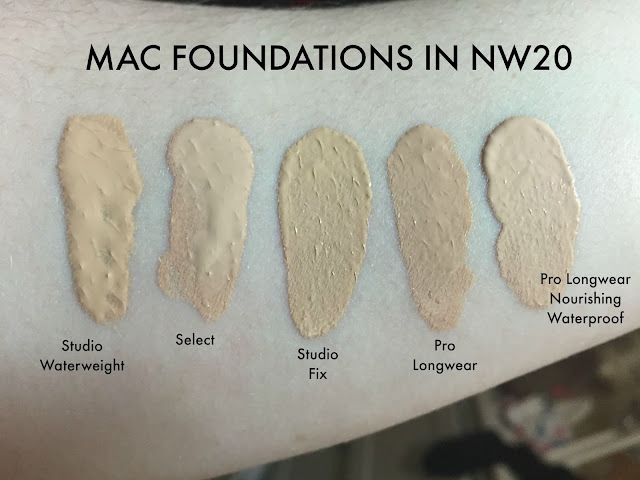 Also- an important point to note and something that has been bugging me about MAC foundations in general for a while now- I take NW20 which is usually fine, however, I feel like an NW20 in Studio Fix is not the same as NW20 in Pro Longwear or Studio Sculpt. Some are more pink, some are more yellow, some run visibly lighter and some run visibly darker- yet they are all meant to be the same shade. I would definitely pick up a sample or try this out in store under natural light to make sure the shade that you always go for will still work for you. All of these MAC foundations are in the shade NW20 believe it or not! Overall, I was underwhelmed by this foundation- it's not a patch on the MAC foundation release before this one, the Pro Longwear Nourishing Waterproof foundation. This foundation promised glow and radiance, and whilst I do love a bit of JLo glow, all I got from this was oil slick shine, and I'm not oily skinned. I'm not saying it's horrific and I'm sure it serves a purpose, it just did not deliver for me. Are you interested in trying out this new MAC foundation? What is your favourite MAC foundation offering? Great review, think I'll be avoiding this, very disappointing! I really want to treat myself to a new MAC foundation, but will avoid this one due to your honest review sounds like it wouldn't work for me! i must be honest i really do not like watery foundations at all! i feel like they do nothing for dry skin. i'm using pro longwear at the minute and love it. i think i might try studio fix or the nourishing pro longwear next.